Aoba lives with his grandmother Tae and works part-time in a junk shop in the Old Residential District on Midorijima, an island divided in two. An entrepreneur, Toue Konzern, has converted the other part of the island into Platinum Jail, an exclusive luxury resort. Aoba and his AllMate AI pet dog, Ren, navigate their way through the various turf wars taking place on the island until they are both propelled into the dangerous online game ‘Rhyme’ set in a virtual world. 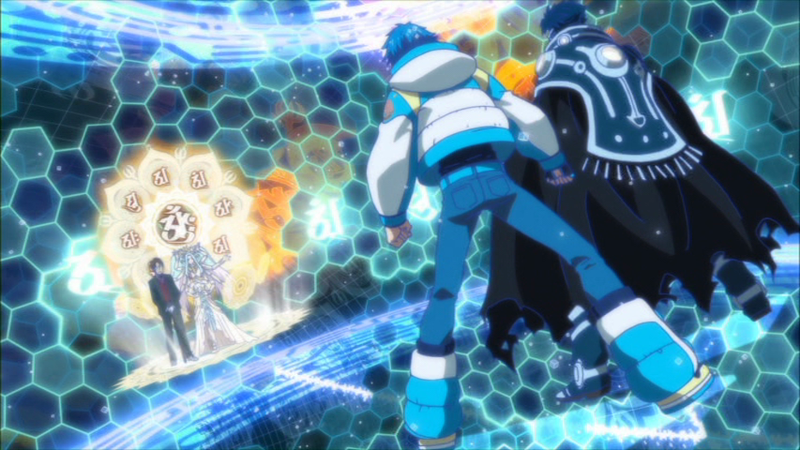 This unleashes another personality buried deep within Aoba, ruthless and possessing a dangerous psionic power. Aoba’s peaceful life begins to crumble around him as sinister strangers seek him out and those closest to him go missing. What lies buried in his past that is triggering these events – and how can he solve the mystery without harming those he holds most dear? But as Aoba and his friends are invited to enter the futuristic paradise of Platinum Jail, it becomes apparent that the answers to the mysteries in his past – and the other Aoba – can only be solved by walking into enemy territory and confronting Toue Konzern. DRAMAtical Murder (2014) is based on a popular Japanese BL visual novel from Nitro+CHiRAL, the company famous (infamous?) for their adult-rated BL series like Lamento and togainu no chi. A lot of artistic talent goes into the creation of these games, with high-end character design and top-notch voice actors. Not surprisingly, they are very popular in Japan, inspiring cartloads of doujinshi and special cafe events and, inevitably cute and collectable merchandise! The manga that have come out based on these series have been less successful, and – like this anime TV series – they don’t portray anything of a sexual nature other than the occasional smooch. It’s also significant that DRAMAtical Murder was made before the recent phenomenal success of Yuuri!!! On Ice which, one hopes, along with the charming film Doukyusei (not yet available in the UK) will make it possible for more Slice of Life, character-based BL stories to be told well in anime and reach a wider audience. DRAMAtical Murder most definitely ain’t Slice of Life, placing itself firmly in the cyber science fiction category, allowing for the presence of AIs, virtual reality and altered minds. So, yet another anime series based on a popular visual novel, only this time the male protagonist has the choice of several very different male partners. The main challenge is to gently tease the audience as our hero meets each of his potential love interests (could this be The One?) but – in the interests of creating a satisfying drama – the writers may well opt for a path that diverges from the one the viewer personally favours. This can result in a bland, unsatisfying storyline as nothing is ever properly resolved. Touken Ranbu, another recent series based on a popular otome game, almost imploded under the weight of characters that the writers felt duty-bound to introduce so as not to offend any fans by omitting a few. And when watching such a series, there’s always the nagging feeling that the creative team are writing solely for the existing game-playing fans. However, that isn’t really a problem here as the writers have produced a self-contained story that – after a few initial hitches – delivers the goods: it actually resolves the issues that it sets up at the beginning. And how many anime series do that? Who is Aoba? Why does he suffer from immobilizing headaches and loss of memory? We get to learn more about him in his interactions with the various men he gets embroiled with in his search, ranging from his tattooed childhood friend Koujaku, through IT genius/hacker Noiz to strong, silent, bike-riding activist, Mink. All of the men he encounters have tragic back stories which lend them greater depth and interest as Aoba learns the truth about them. One of the deepest and most philosophical conversations occurs in Episode 4 with Clear, the mysterious gas-mask wearing, umbrella-carrying stranger who insists on calling him ‘Master’. In fact Aoba’s interactions with Clear deliver some of the most touching moments in the series as he comes to realize that Clear is probably not human… but would really like to be. 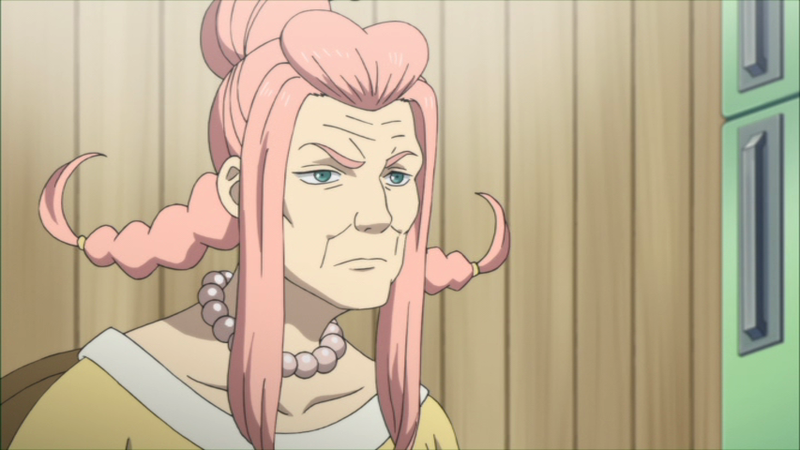 Kudos to this series, as well, for the depiction of Tae, Aoba’s dynamic and feisty grandma, who knows more about the sinister goings-on in Platinum Jail than at first she is willing to share. We need more feisty grandmas! 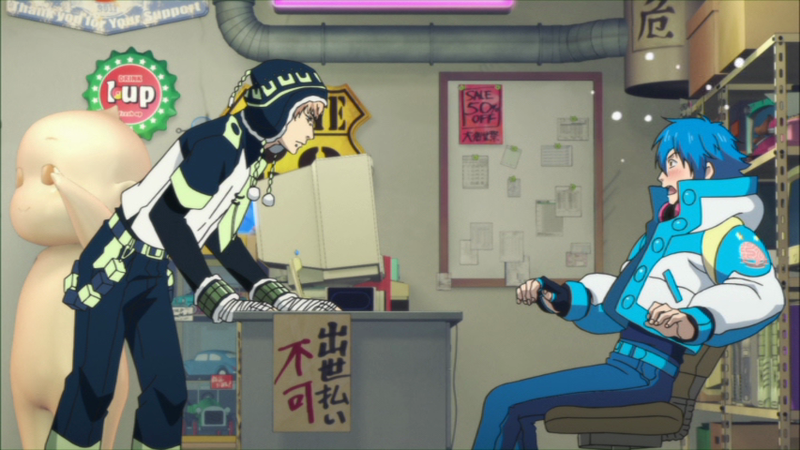 When I first watched DRAMAtical Murder weekly on Crunchyroll I was rather underwhelmed, but returning to it (some early animation quality issues resolved) I was pleasantly surprised. As science fiction, it’s not very original, but the issues it explores about identity and consciousness through Aoba, Clear and Ren are compellingly and relatably done. DRAMAtical Murder relies on a street-smart grunge to lend it some authentic street-cred, hence the different gangs like Morphine, Dry Juice and Benishigure with their tags, allegiances, tattoos and territories. Oddly enough this gives it a slightly old-fashioned feel, as if it’s trying a little too hard to combine the gritty realism of togainu no chi with a futuristic VR gamer-vibe. 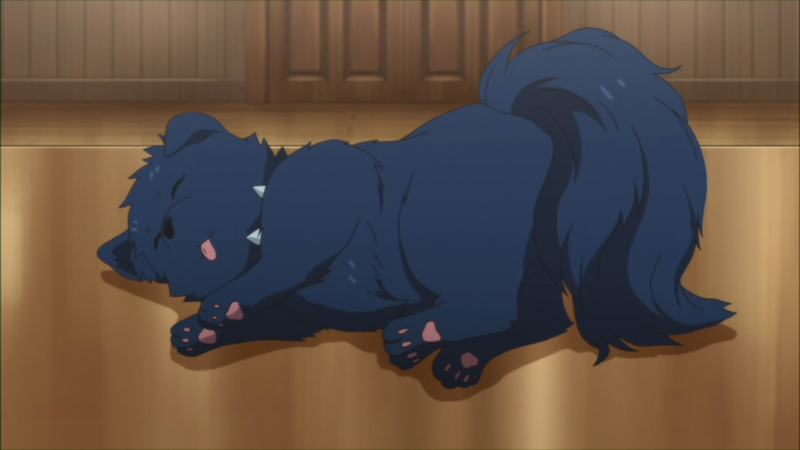 However, the character designs are attractive and the comic potential of the AI AllMate pets is milked (but not too much) alternating between the cute (little blue doggie Ren with his protruding red tongue) and the distinctly eccentric Beni and Tori birds belonging to Koujaku and Mink respectively. Music is by Yuuki Hayashi (who has recently provided some fine soundtracks for My Hero Academia, Kiznaiver, Haikyu!!) and delivers here an appropriately futuristic palette of electronic sounds and tracks (synthesized and guitar) to enhance the futuristic world of Platinum Jail and Rhyme. A nice touch is the retro game music vibe that accompanies the teasing game clues Aoba receives. Nevertheless, it’s Hayashi’s understated and subtle theme for piano and strings which underscores some of the more emotional scenes that is by far the most effective. The Opening Theme “Slip on the Pumps” (frankly not my favourite) and main Ending Theme “Bowie Knife” are by rock band GOATBED and are notable mostly for their unintentionally funny lyrics. There are also four different Ending songs for each of the other main characters: “BY MY SIDE” by Kanako Itou (Ep. 7) for Koujaku; “Felt” by Seiji Kimura (Ep. 8) for Noiz; “Lullaby Blue” by Kanako Itou (Ep. 9) for Clear and “Soul Grace” by VERTUEUX (Ep. 10) for Mink. These play over a sequence of luminous and attractive character stills. A US dub script by George Manley flows more colloquially than the subtitles (although with some questionable choices) and the delivery by the voice cast is way too variable in quality. Veteran VAs like Greg Ayres as Clear and Andrew Love as Mink deliver but, disappointingly, in the crucial main role of Aoba, Gabriel Regojo just hasn’t got the range or the charm that the excellent Atsushi Kisaichi brings to the role. I’d recommend the Japanese cast every time. The inclusion of the unaired 30 minute OVA “Data_xx_Transitory” is a bonus that will make this Animatsu set very attractive to BL fans as it includes slightly more edgy material (and is probably what earned this set the 15 certificate in the UK). My own feeling is that it doesn’t really add that much to the story as it’s a tad repetitive (and, if it’s only taking place in Aoba’s mind, suggests a rather more masochistic personality than the one we’ve been shown throughout the episodes). The DVDs are reviewed here – but the set on sale from Manga-Animatsu is a Blu-ray/DVD combo comprising 5 discs. The only extras are Clean Opening and Endings and four trailers. 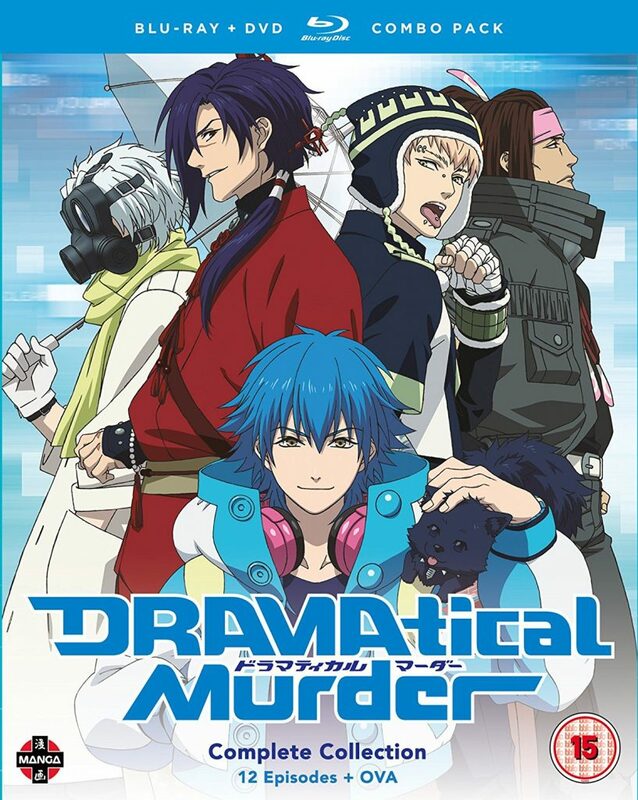 DRAMAtical Murder works rather well as a sci-fi mystery adventure with sympathetic main characters, luminous backgrounds and an attractive, versatile soundtrack. If you’re a BL fan, however, there’s very little to get excited about as it’s all (bar the OVA) very chaste.